Hello there! While our regularly scheduled reviewer Adam is out, I’ll be doing what you might call the “fill-in team” issue of DC Rebirth Round-Up. This week proved to be quite thrilling for an even-numbered week. 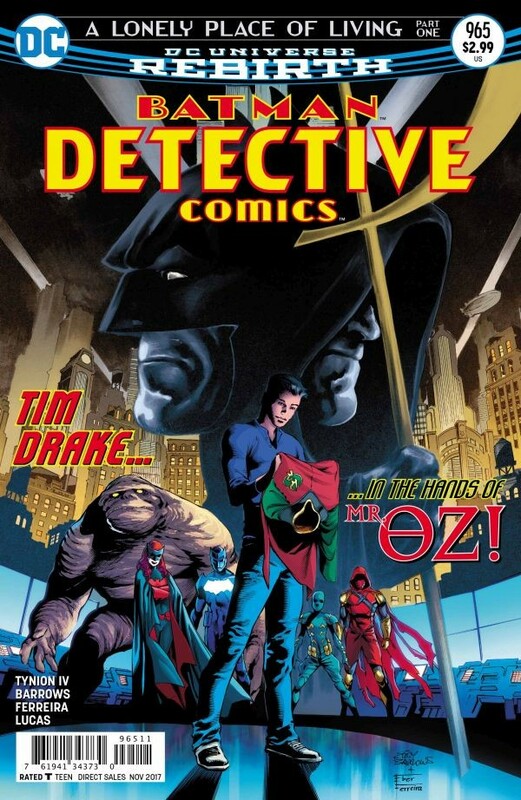 Detective Comics #965 (Tynion/Barrows/Ferreira/Lucas): One of the most underserved characters in The New 52 was undeniably Tim Drake. Between being largely relegated to the Teen Titans book and being cut off as a Robin, but here that changes. Tynion takes over a year of buildup and lights the fuse with a story to illustrate just what Tim means: both to us and to the DCU as a whole, and it’s nice to see that such a beloved character is finally getting to shine in his own right again. Wonder Woman #31 (Robinson/Pagulayan/Parsons/Paz/Hanna/Fajardo Jr.): Following up on a run as adored as Rucka’s was always going to be a tall order and James Robinson was an interesting choice if nothing else. However, based on this first issue, there’s going to be some growing pains to work through. For one Wonder Woman is practically a guest star in her own comic. And while Robinson makes an effort of calling this a palate cleanser (very abruptly) within the story, it feels like more of a deep cut given that this comic seemingly ties into and contradicts Metal. Hopefully it ticks up. Rating: Three Grails Out of Five. Flash #31 (Williamson/Googe/Vasquez/Plascencia): Flash has been fantastic under the current team, however it’s experienced something of a downturn with this storyline featuring Barry Allen at his mopiest since he took the Negative Speed Force. While there’s nothing wrong with heroes overcoming adversity, it gets a bit comical with Barry being emotionally beaten down like his TV show counterpart. Part of the fun of Williamson’s run has been embracing the fun of being the Flash, hopefully that returns. Rating: Three Bloodworks Out of Five. Action Comics #988 (Jurgens/Sook): Jurgens’ run has been hit or miss for me, but The Oz Effect was really the kick this book needed. While it’s unlikely it’ll last, Jurgens does a great job of breaking one of the most fundamental tenets of Superman’s origin. Jor-El showing up to tear down the values Superman holds dear, including his faith in humanity isn’t one that sounds good off-hand, but it really works well here. Here’s hoping this uptick continues. Rating: Four Jor-Els Out of Five. The Winner: Detective Comics is a return to form for a beloved character and a top-notch comic in the always fantastic Batman line. Definitely worth visiting. The Loser: Wonder Woman definitely feels like it slipped after Rucka’s seminal run. Here’s hoping this is just a blip, but so far it feels like it’s missing why there needed to be a reset.